Blame the whites for climate change? Back when the climate was perfect, and there was no internet, no cars, no electricity lines, and not a single evil coal fired station – ominously, the Australian climate was changing. Back in 1846, the population of Australia was essentially just the size of the city of Canberra (a mere 340,000 people). They all rode bikes, or horses, or walked to work; it was “Earth Hour” every hour; every plasma screen was not just on standby, it was permanently unplugged. Stephen Goddard found the quote. And so history repeats. The climate is always changing and it’s always blamed on target number one, whomever that may happen to be. If it wasn’t the witches, it mustv’e been the whites. Though I’m not sure how much land-clearing had been done by 1846. I suspect it was minor. Hat tip: Roberto Soria (who also wrote the ARC grant post recently). 14 comments to Blame the whites for climate change? The typical leftist attack, blame the whites and pander up to the Aboriginals. You can’t blame them for anything nor say anything against them. I guess blaming us whites for Global Warming in Australia was inevitable. Australian Aboriginal people are often credited with being good land managers. The process of burning (fire sticking) is lauded as traditional land management which reduced the fuels which cause hotter damaging fires and which promoted the development of fire resistant flora. But many scientists also suggest this process had a negative impact on local flora and fauna and even regional climate. But even our good buddy Tim Flannery (1990)believes that Aboriginal people were far from perfect custodians of the environment. He suggests Australian megafauna were hunted to extinction by Aborigines soon after they arrived. He argues that with the rapid extinction of the megafauna, virtually all of which were herbivorous, a great deal of vegetation was left uneaten, increasing the standing crop of fuel. As a consequence, fires became larger and hotter than before. The indigenous hunting method of burnings of the bush (fire sticking), so they could easily catch the fleeing wildlife would have done nothing good for regional climate. The process replaced many trees and bushes, which take decades to grow in low rainfall environments, with grass lands which was not a great idea. Sure this promotes grazing wildlife which were preferred as a food source by Aborigines, but it also creates soil problems. The populations of grazing fauna booms in times of plenty, but leads to overgrazing in drier years. The grasslands also dry out over summer. The grazing and dry grasses leave the soil bare and unprotected from wind and rain erosion and top soil degradation. This is because there are no deep roots holding the soil together and no trees shading the soil. The soil then retains less moisture and gives that moisture up too readily. So contrary to the popular and generous theory that Aboriginals were ‘managing’ and ‘caring’ for the land, a proper analysis shows they often depleted flora and fauna diversity and quite likely had an impact on local climates. Of course settlers continuing this process to increase grazing land did not help! But at least it could be argued that they were producing meat, wool and leather more efficiently and with less waste for the local population and for trade and export. They cleared much less land and killed much fewer wildlife per head of those they fed and clothed compared to Aboriginal methods. 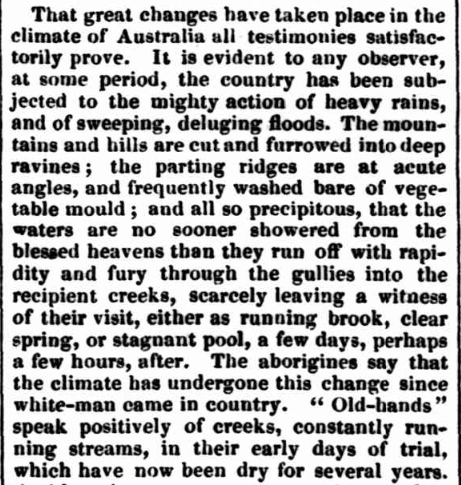 The natives were about, burning, burning, ever burning; one would think they … lived on fire instead of water.’ Ernest Giles (1889), Australia Twice Traversed. The natives set fire to the grass which is abundant everywhere, and at that time is quite dry… The conflagration spreads until the whole country as far as the eye can reach, is in a grand and brilliant illumination.’ Report from Port Essington, in Arnhemland. … the very extraordinary devastation by fire which the vegetable productions had suffered throughout the whole country we had traversed – George Vancouver. I wish it would rain and cause the grass to become green, so as to stop them burning… – Stuart (1865). So it’s hardly appropriate for Aborigines to point the finger at ‘White Men’ for causing climate change, not withstanding the fact that global climate change is an ongoing and natural process. It seems to me that the only BLAME is in the eye of the reader. When i first read this on Steven Goddard’s tempory alternate site I took it to mean blame also. However thinking about it how would a people without a calendar describe events and put them into a time frame? If it rains all day at your place then your friend Bob turns up might you not say “The weather has undergone this change since Bob came into the house”. You are not blaming Bob. Before “white-man came in country” is just like saying before the Maunder minimum ended as a long term look at history or before the Dalton minimum ended as a short term look from the year 1846. What these people have done is to cause the fact that the climate had undergone recent rapid change to be recorded in this newspaper! Regardless of Tim Flannery pointing the bone at them and blaming them for causing it the important fact is the time frame also shows that their fire sticks could not have caused this rapid change. The fires may have caused a slow change but not one they could associate with the time frame. Jamez quote above “I wish it would rain and cause the grass to become green, so as to stop them burning… – Stuart (1865)” is possibly right on the money also. In wetter years the fire sticks would not be of much use. They would not do much different to what lightning would do in any case. However human efforts to put fires out may have acheived a lot of improvement to the climate since. Nature via lightning starts Tim Flannery’s chain of events which is more likely to meet a dry fuel load now that the Maunder minimum has ended. Then Man puts the fires out thus saving the environment from Flannery’s evil Gaia. When Charles Sturt got to the junction of the Murray and Darling rivers, he found 5-6 metres of water depth. Yet the previous year was a drought year in the upper Darling. Note: there was enough water in the Macquarie for them to float straight through the swamps to the Murray. When they got to the end of the Murray, Sturt found Lake Alexandrina full, but didn’t find the outlet to the sea. Possibly he assumed there wasn’t one and didn’t look very hard. The return journey was slow because of the current in the Murray. That was in 1829! Such climate change is not likely to be due to CO2, is it? It was common for all mankind to have some ‘way’ of inducing God or the gods to bring rain or ease rain. Tribes had their rainmaker men. Churches prayed to their gods or God for rain. Weather variability is so common and fearful that anyone who gives an impression of limiting the changes is lauded and given high status in any community. That includes our so called scientific developed economies. It was the witches and later the whites. The obvious culprit is a white witch, or as I refer to her, my ex-wife. The comments are still missing (sorry) but the google cache page is here. Good points Siliggy. I also believe in any event, what the Aboriginal people did, or what the settlers did after them could at best have an impact on the regional climate, not climate as a whole. Oh yes Jamez I agree. My point was that our climate has and will continue to vary all the way from deep wide flood to the total erasure of every living thing in dry hot fire but that we may now have the ability to weaken the fire part a bit and save some of those cute fury animals from natures cruel kaos.